Go green and make surf and skate art with recycled materials! • Kids can create art inspired by The Ripple Effect and Making Waves exhibitions. • Use the recycled shavings from skateboard wheels to make hanging jellyfish. • VANS Off the Wall! : Head to the Museum Shop and meet artist Sean Yoro who will be doing a painting demonstration on a giant Van’s shoe. Kids can decorate Vans tote bags and trucker hats while they watch Sean work. 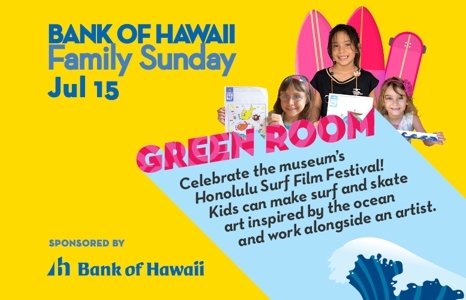 Men in Grey Suits: Enjoy tunes from Hawai‘i’s premier surf rock band from 11:15am-12pm. Tavana: Watch this Na Hoku Hanohano Award-nominated multi-instrumentalist use electronic drums, guitar, ukulele, and banjo to play island-inspired rock and blues from 12:15-1pm. Given: 10:30am + 1pm. Free. Kaua‘i surfers Aamion and Daize Goodwin (Singlefin: yellow) set off on a year-long global adventure with a toddler and a newborn. Follow their globetrotting in this cinematically stunning film, told through memories of their six-year-old son—Given. 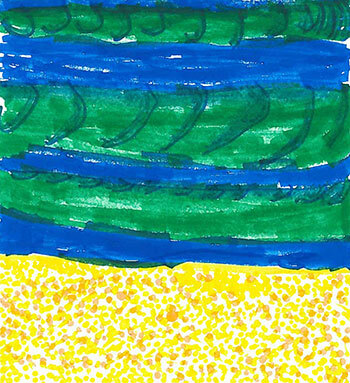 Congratulations to last month's winner, Luke Herring, age 7, from Downtown Honolulu!